Food and beverage processing applications rely on rubber products to prevent contamination. Optimize your process for aggressive thermal and chemical conditions with resilient rubber products from Minor Rubber. We are a leading manufacturer of molded, extruded, and fabricated rubber parts for the food, beverage and dairy industries and their suppliers. Whether you need production of existing components, prototypes for research and development or replacement items for hard-to-find or obsolete applications, we have the capabilities and expertise to supply quality rubber parts on time and within budget. 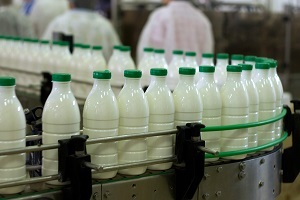 Food, beverage and dairy processing environments include intense pressures, extreme temperatures, unique process media and unforgiving chemicals. Rubber components must withstand a diverse range of challenges and ensure unwanted contaminants are not released into the process line. Minor Rubber can develop Food & Drug Administration-certified rubber parts to help the food and beverage processing industry generate sanitary and hygienic products safe for consumption. Using only high-quality materials, our sanitary rubber products form a secure barrier between surfaces to prevent leakage and contamination. They are also less likely to adhere to equipment fittings. Off-the-shelf rubber products aren’t always best suited for demanding sectors like food, beverage and dairy. Inadequate materials can fail over time due to temperature, fading, tearing, abrasions, chemicals or other factors. Minor Rubber can develop a custom rubber solution for your food, beverage and dairy application. Founded in 1914, our staff can guide you from concept through production to bring your product to market quickly. We utilize industry-leading manufacturing processes, rubber formulations and quality controls. We will consult with your team to gain full understanding of the product and its intended uses. At Minor Rubber, customer satisfaction is our utmost priority. We are dedicated to offering personalized service to our clients, which makes the design, production and receipt of rubber parts simple. Ensure your food and drink products are wholesome and contaminant free with assistance from Minor Rubber. Our experts are available to answer your questions. Request a quote today!